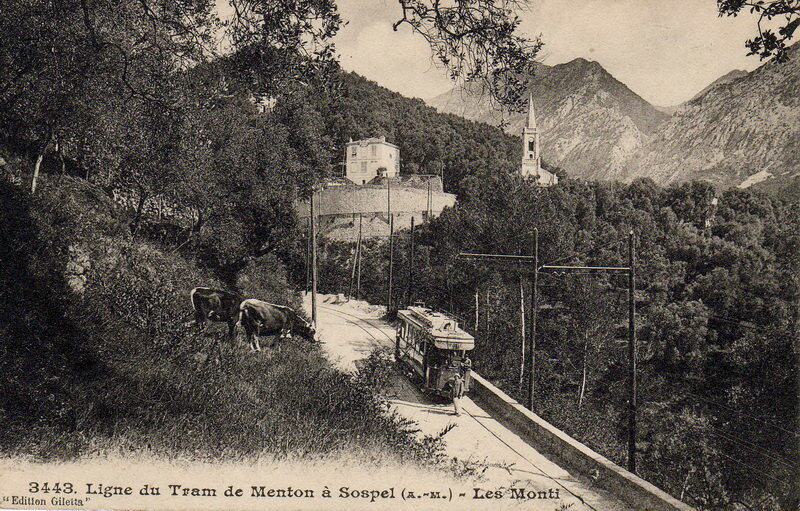 I first posted a very short blog in 2013 about discovering this tramway while on a bus journey from Sospel to Menton. 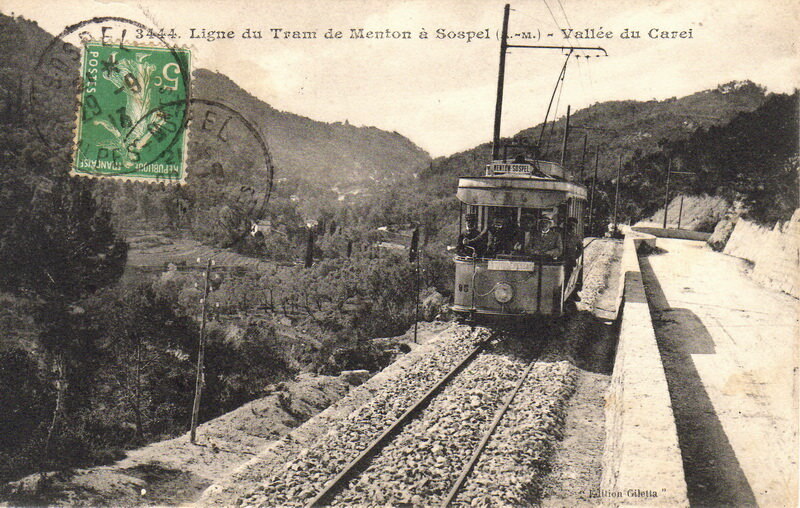 Further investigation has shown just how closely the present D2566 road follows the line of the tramway which when it was in use was remote from the then main road between Sospel and Menton over much of its length, only really following that road in the kilometers closest to Menton. 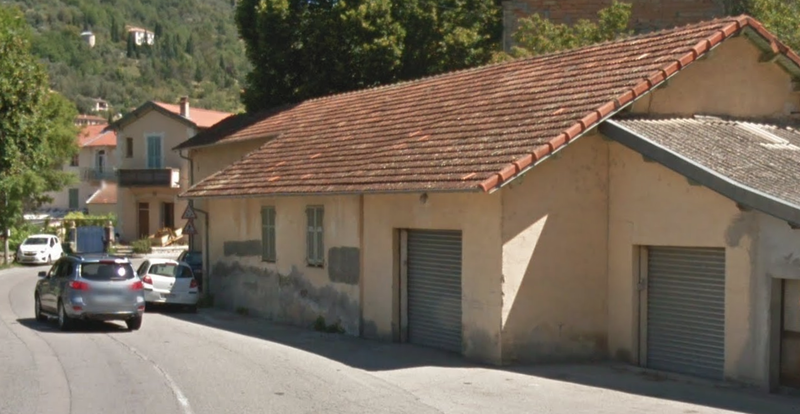 It was written when I was just getting used to the idea of producing a blog and came at a time when I was just beginning to realise the extent of the TAM tramways and the Chemins de Fer de Provence. 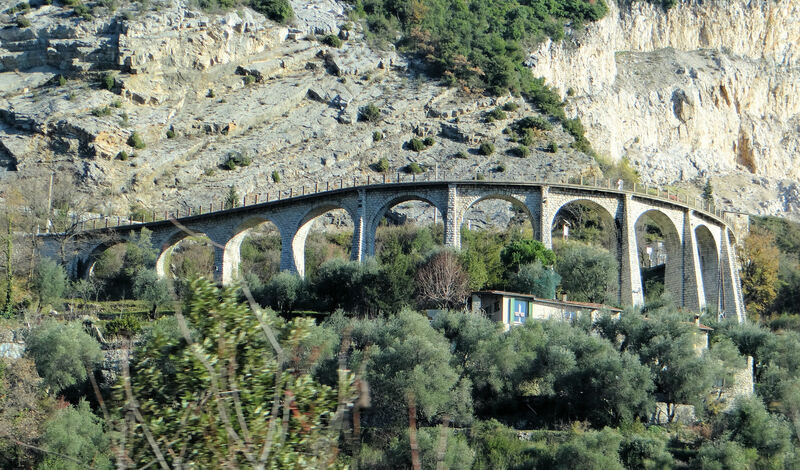 Naively I thought that the Digne to Nice line was a stand alone narrow gauge line rather than being at the heart of a much more extensive network. 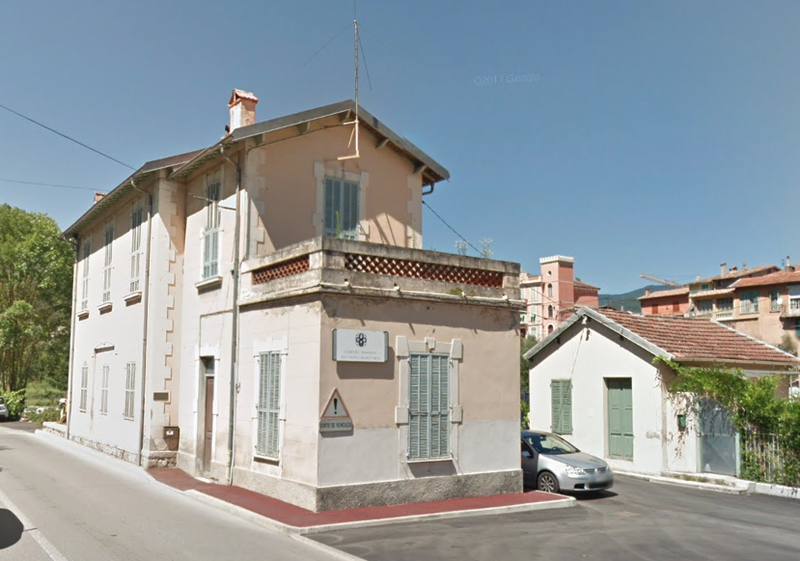 We start at Sospel ………………..
Sospel dates back to the 5th century, when it served as an important staging post on the royal road from Nice to Turin. 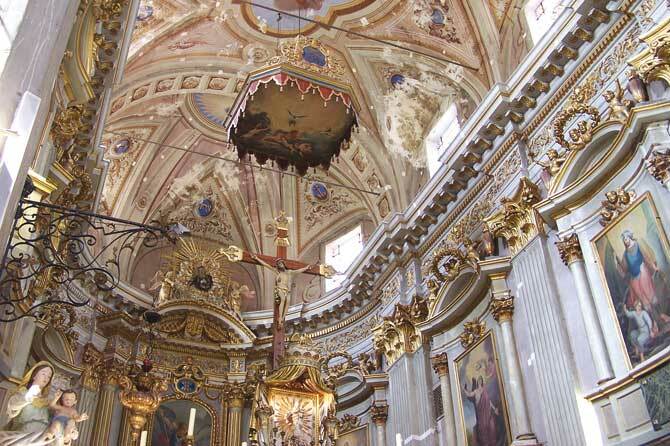 Its main monument is the former cathedral. 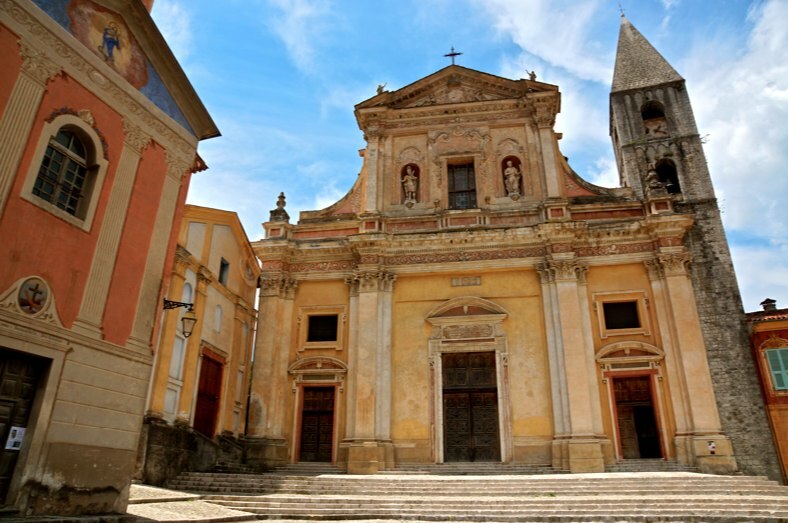 The Cathedral was formerly the seat of the schismatic Bishopric of Sospel, created in 1378 from the Diocese of Ventimiglia during the Great Schism as the Avignon-obedient seat of the effectively split bishopric (the ‘Italian’ part remaining loyal to Rome with seat in Ventimiglia) and restored to Rome’s papal rule and Ventimiglia’s diocesan authority (after three anti-bishops) in 1412; formally recognized as abolished under the Concordat of 1801. the ex-cathedral is now in the Diocese of Nice. 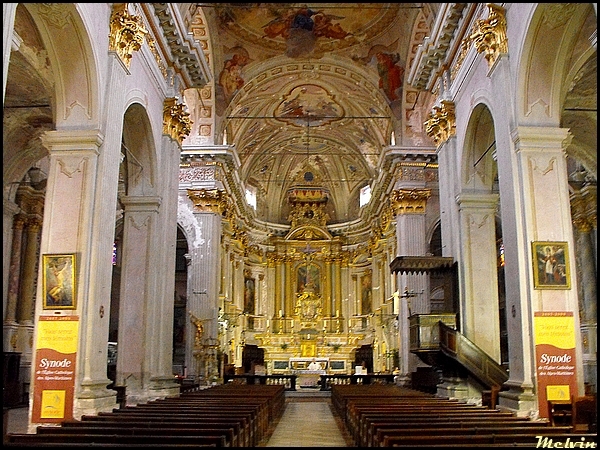 Apart from a belltower of either the 11th or the 13th century, from the Lombard period of Sospel’s history, the cathedral was built between 1642 and 1762, and is claimed to be the largest building in the Alpes-Maritimes. The Renaissance façade is from 1642, and contains in two niches the statues of the town’s protectors, Saint Hippolytus and Saint Absende. Inside, the principal feature is the altar-piece in carved wood in three panels, containing the figure of the “Immaculate Virgin of Sospel”. 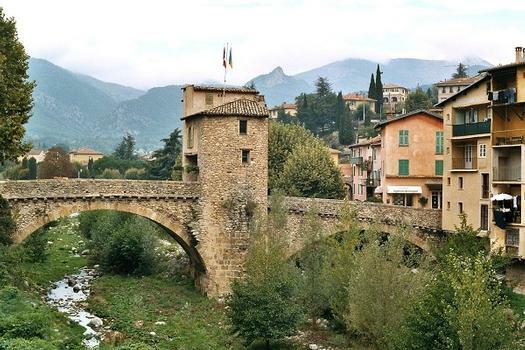 It is by the artist François Brea, of a family of artists from Nice, from the 15th or early 16th century. 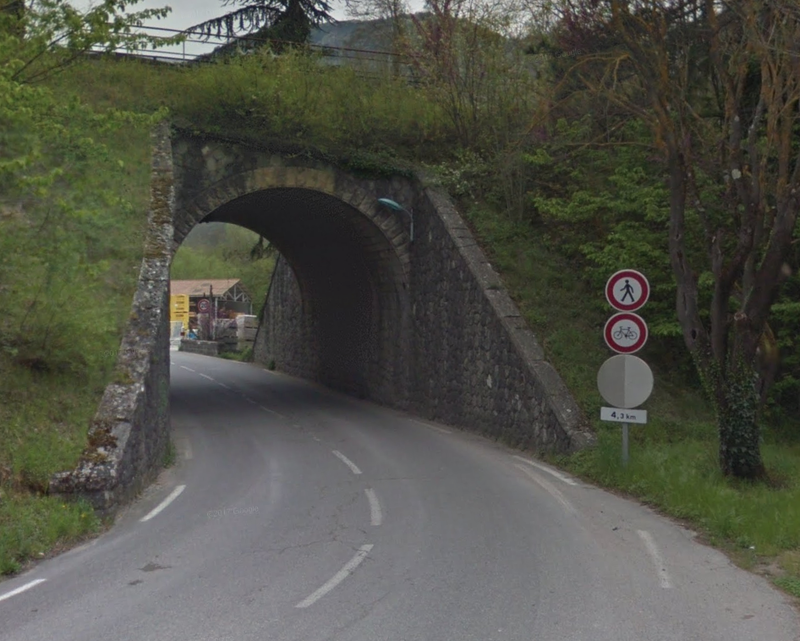 The old toll bridge used by travellers to cross the River Bévéra, built in the 13th century, still stands. 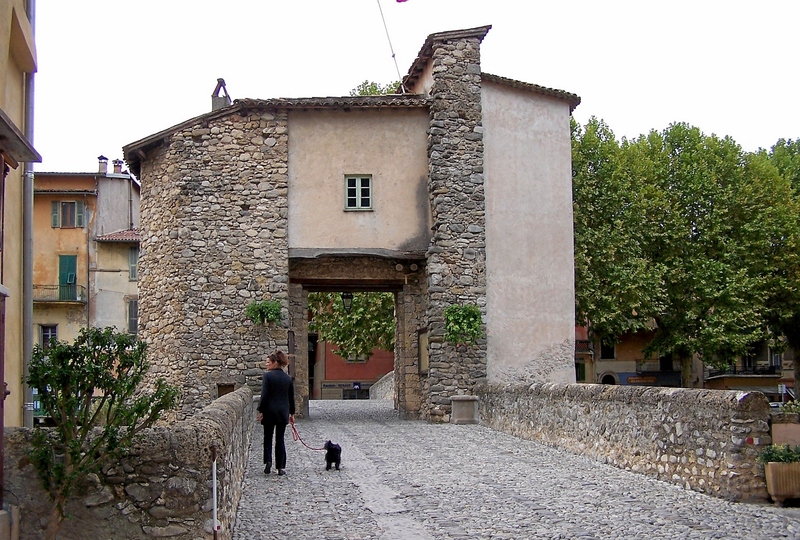 It was bombed by the Germans during World War II to prevent contact between the French Resistance (“The Maquis”) and the Italians. 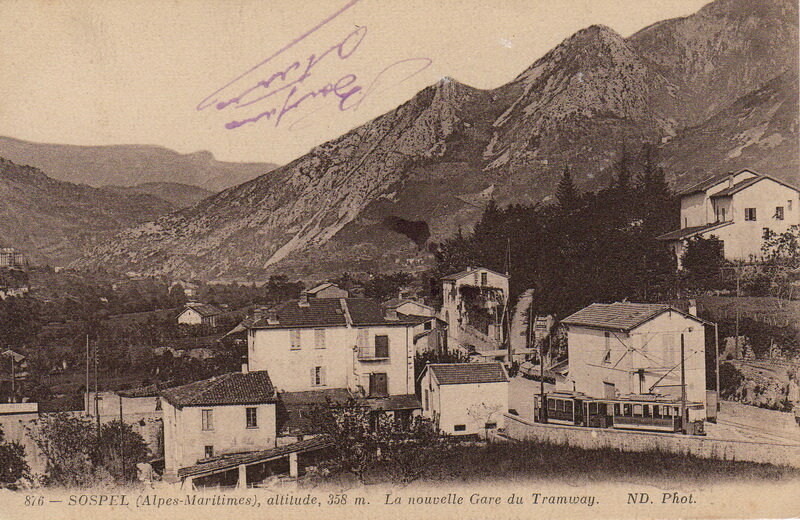 Much of the town was destroyed at that time. 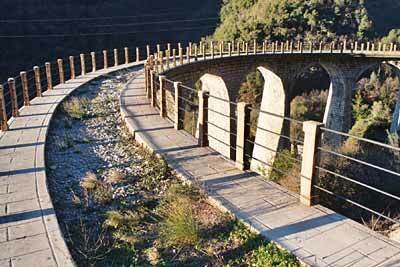 The bridge was renovated after World War II it now houses the tourist office. 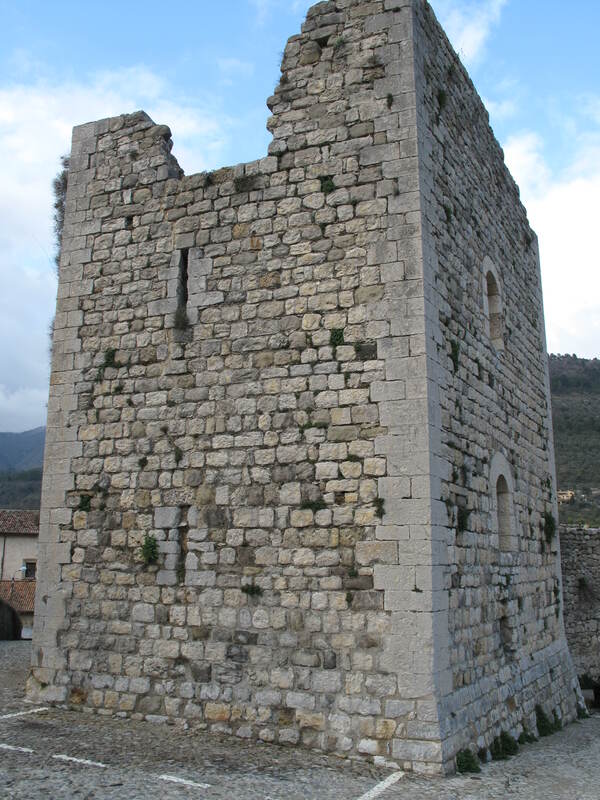 The ruins of a tower, part of a château belonging to the counts of Provence, are all that remain of the 14th century city walls. 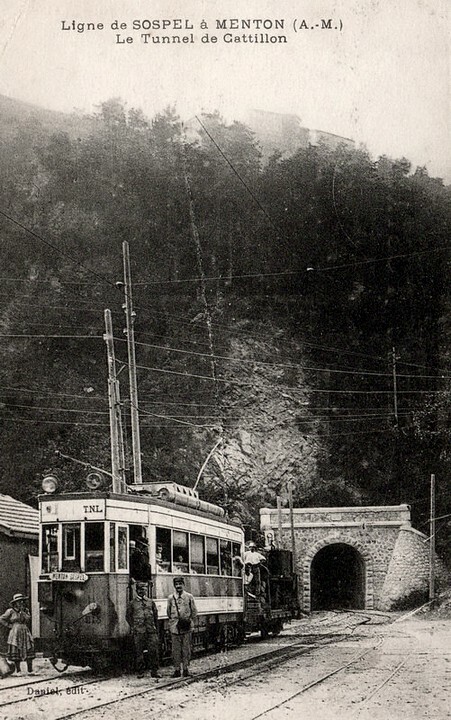 The tramway left the town from a station on the south-side of the river. 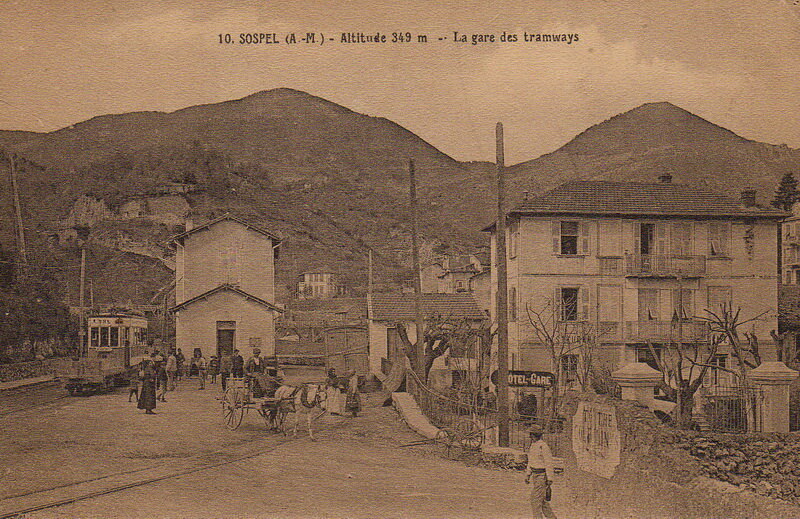 Buildings from the tramway station still exist. 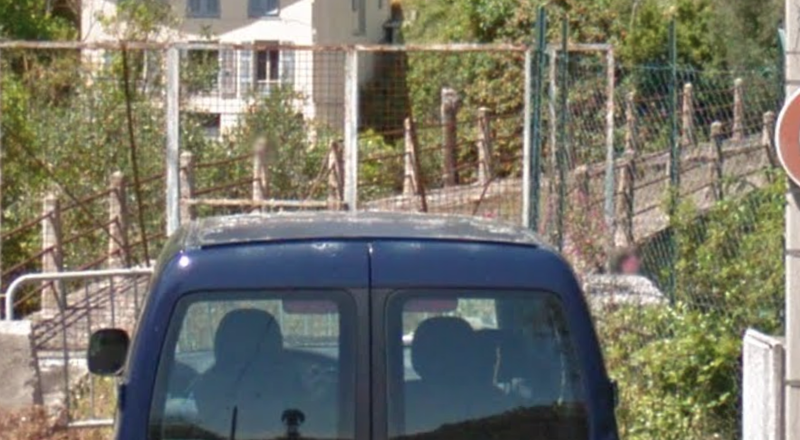 They can be seen on the satellite view below to the east and south of the car-park towards the bottom of the image. 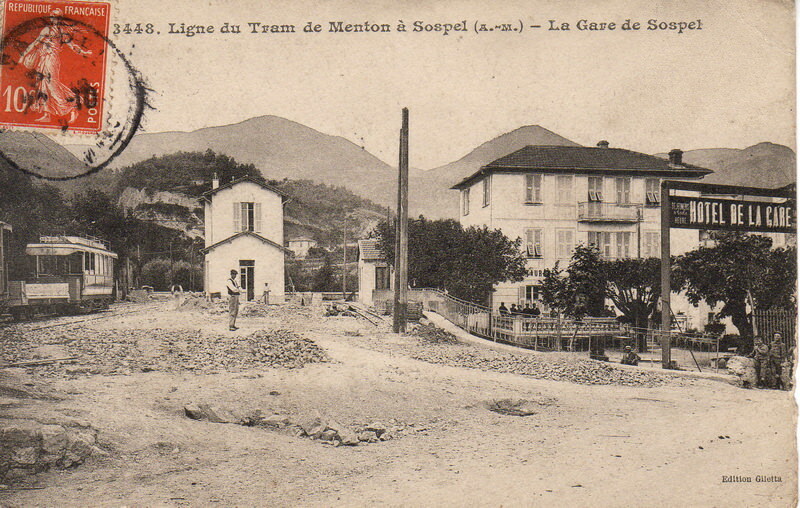 These present day images can be compared with those on postcards from the early 20th Century, some of which are reproduced below. 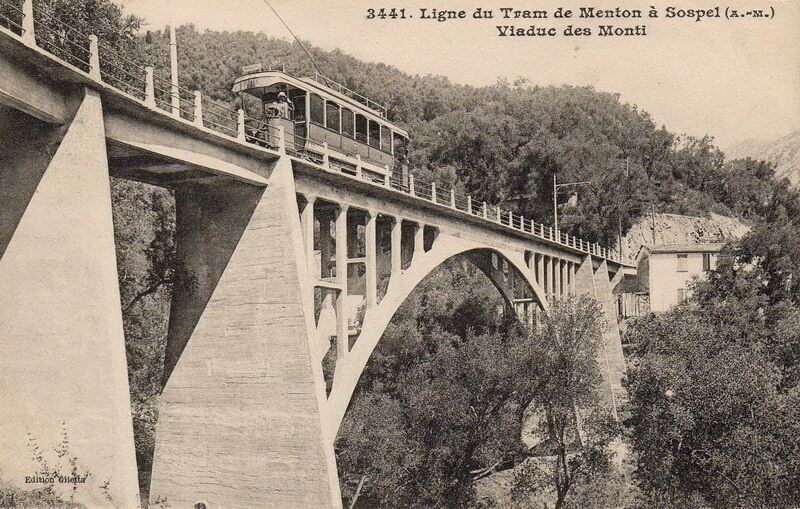 The tramway left Sospel and passed under the Nice to Cuneo line through a bridge which now accommodates the D2566A main road to Menton. 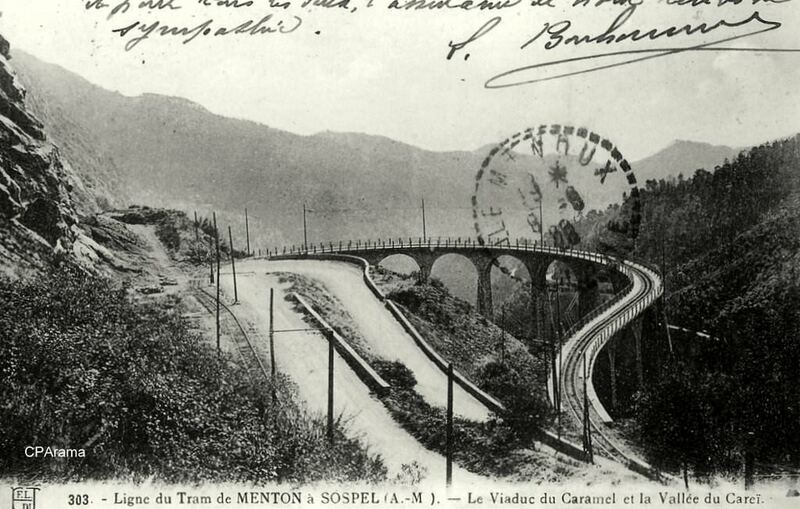 At the time the tramway was operating this road did not exist. 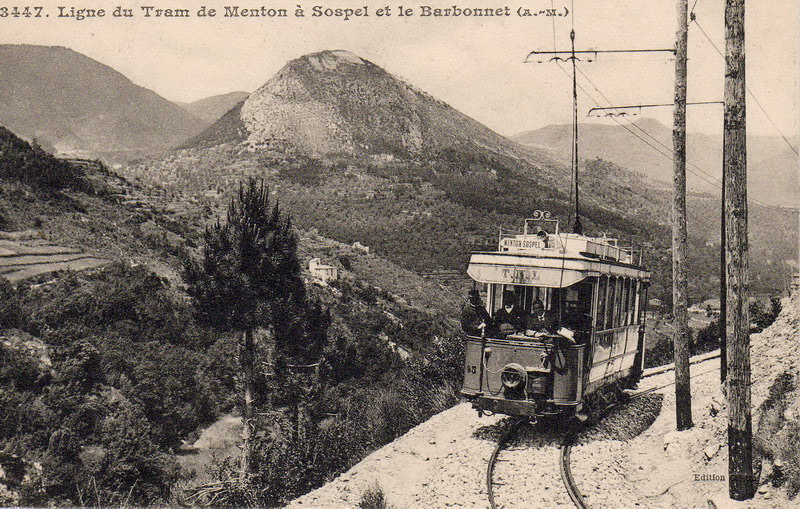 Along a significant portion of the journey to Menton the new road has replaced the tramway. 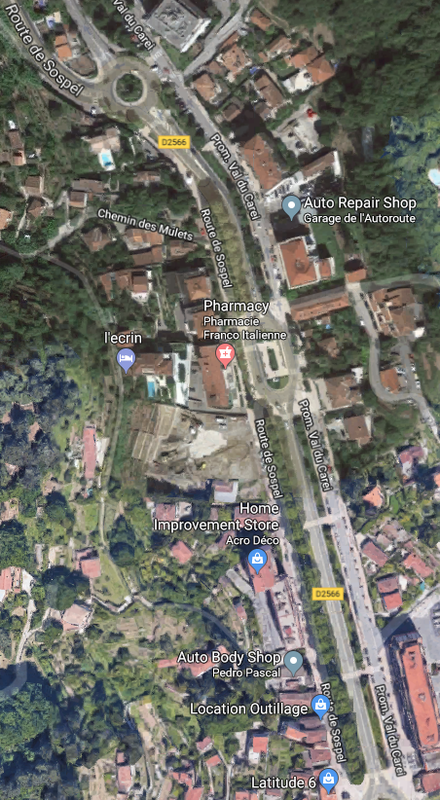 In the map/aerial photograph immediately above, the tramway turned away from the new road alignment into a side valley along what is now called the Impasse de Saint-Paul it crossed the stream in the valley and returned back to the main valley along what is now the Impasse Aigas. 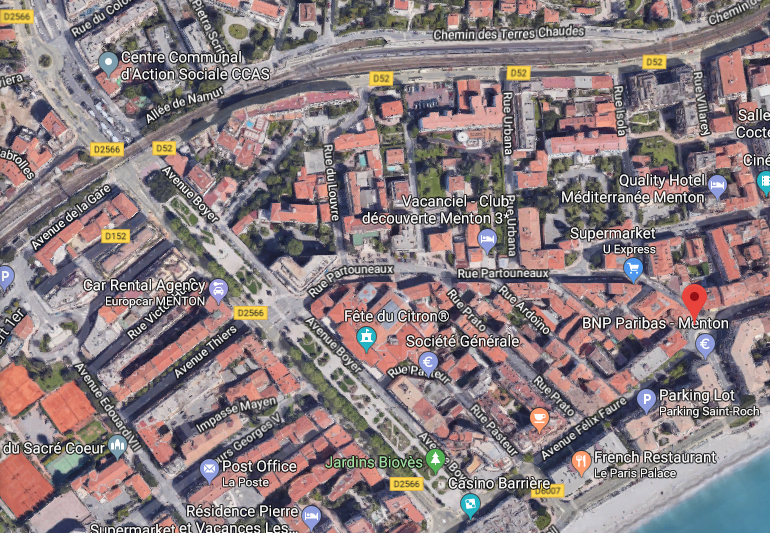 Incidentally the aerial photographs in these images come from the website https://remonterletemps.ign.fr and are dated 1955. 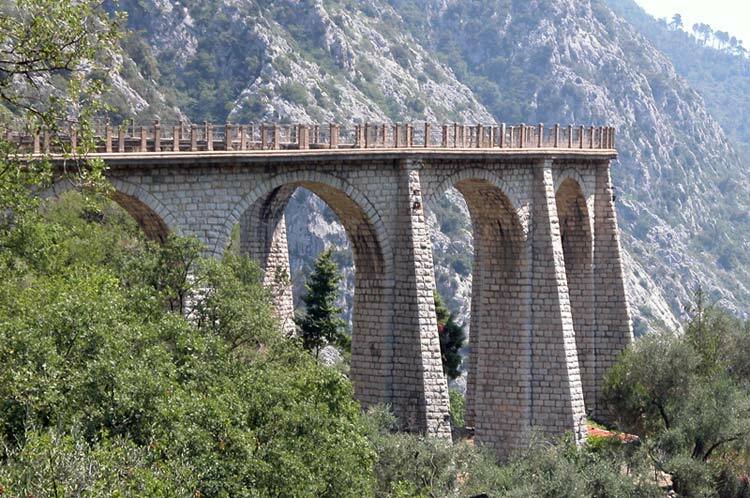 The Viaduc du Caramel is 125 m long andmade up of 13 arches. 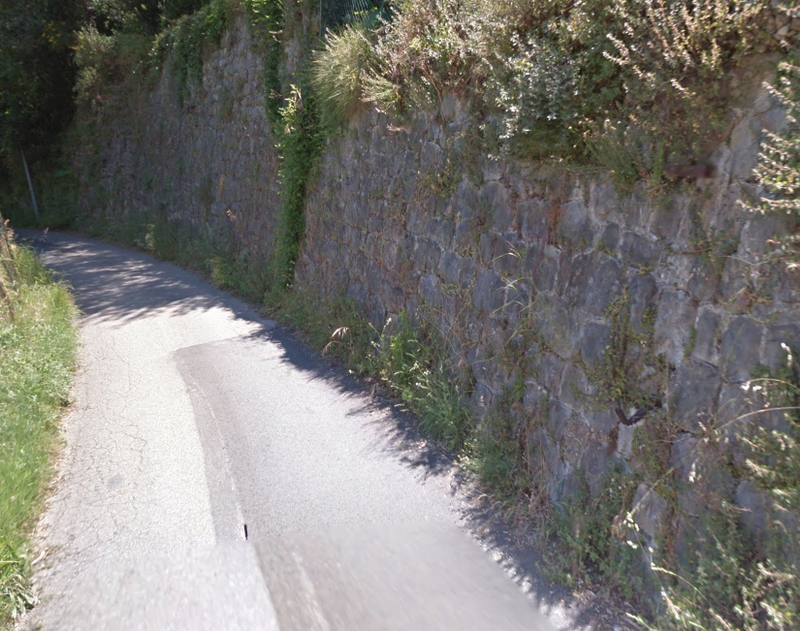 As the photos illustrate it is heavily curved. 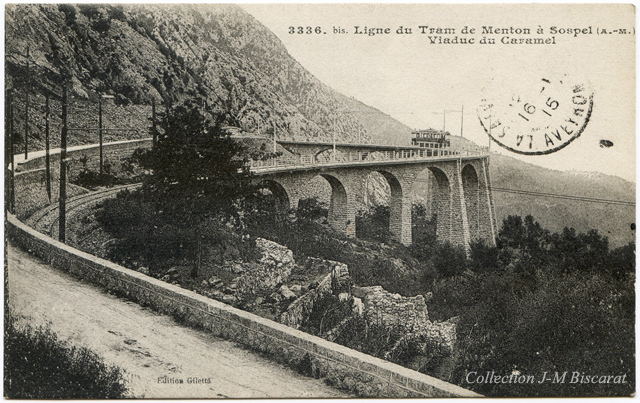 It was built during the period 1908 to 1910. 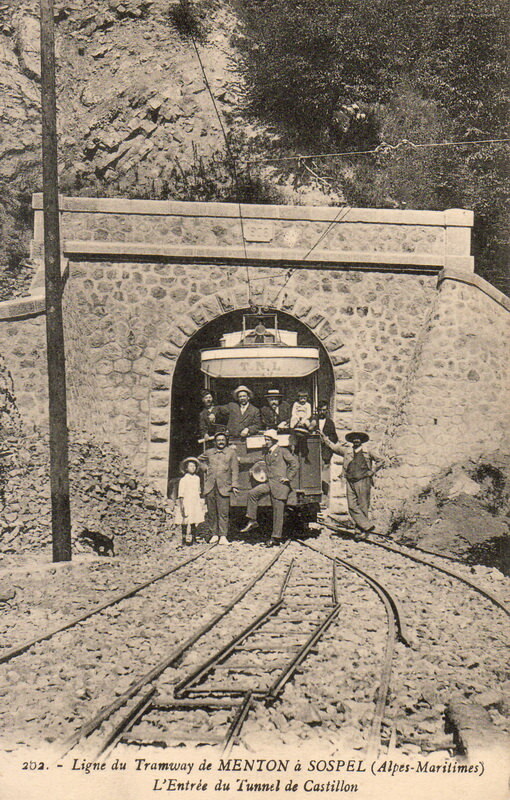 The line was closed in 1931. 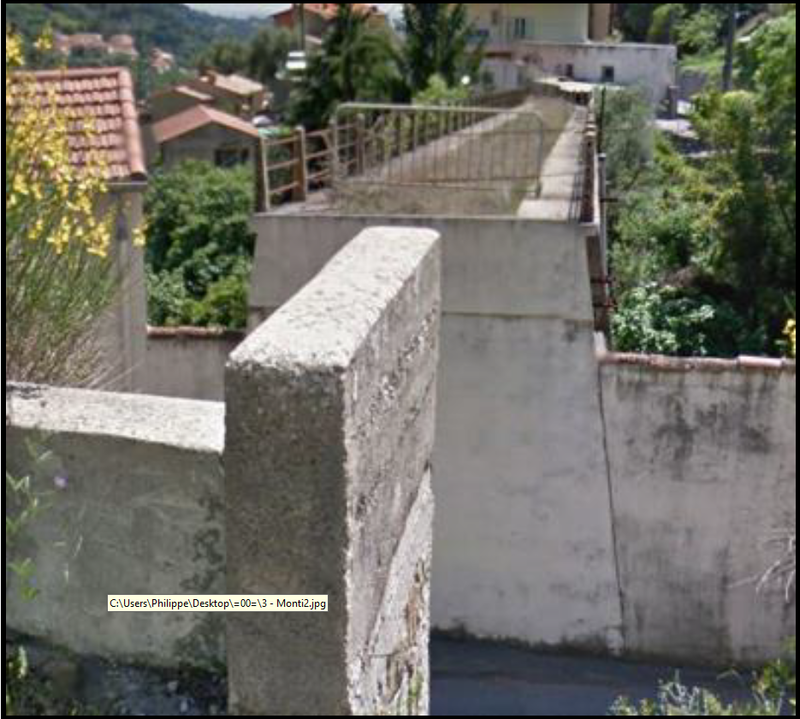 The alignment of the viaduct was imposed by the War Ministry so that it could be easily destroyed if necessary. 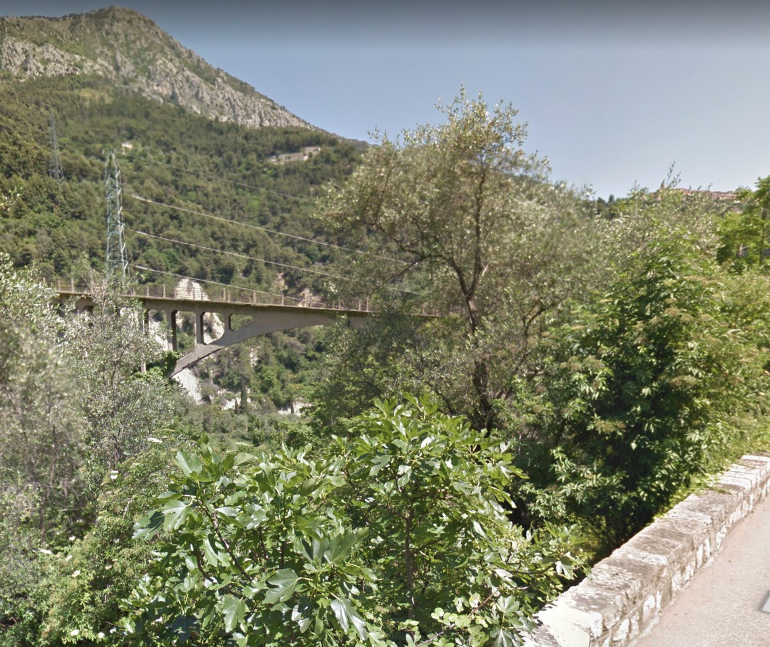 The designer/engineer for the work was Engineer Arnaud, who was also repsonsible for Le Pont de la Mescla (1909) and at the Gros-Vallon Viaduct (1900) towards Annot (Alpes de Haute-Provence). 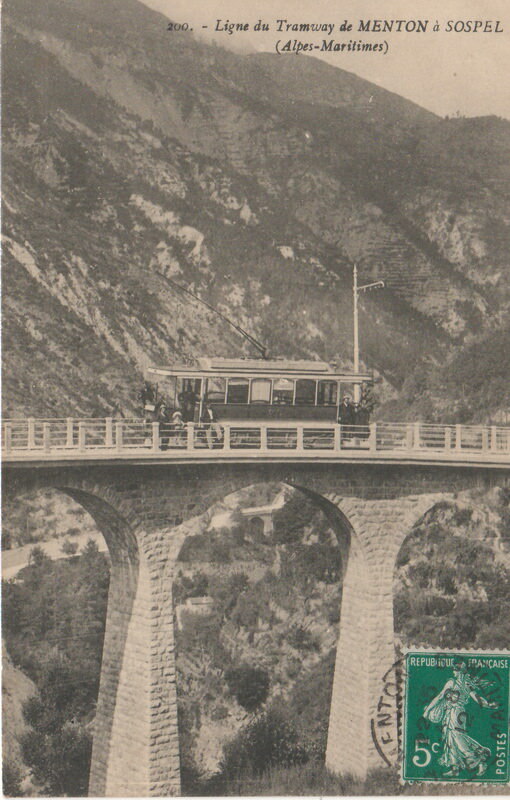 The line and viaduct first carried trams in 1912. 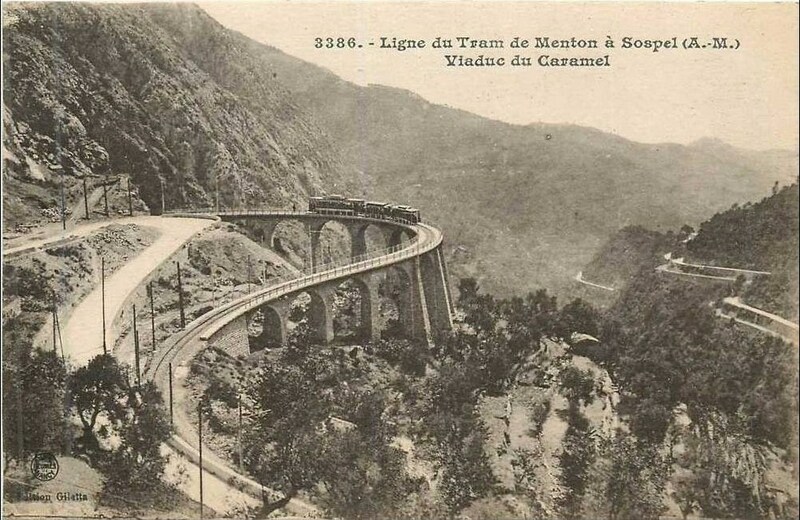 Beyond Viaduc du Caramel the line continued to drop steeply down to Viaduc du Carei which is visible roughly in the centre of the last image above. 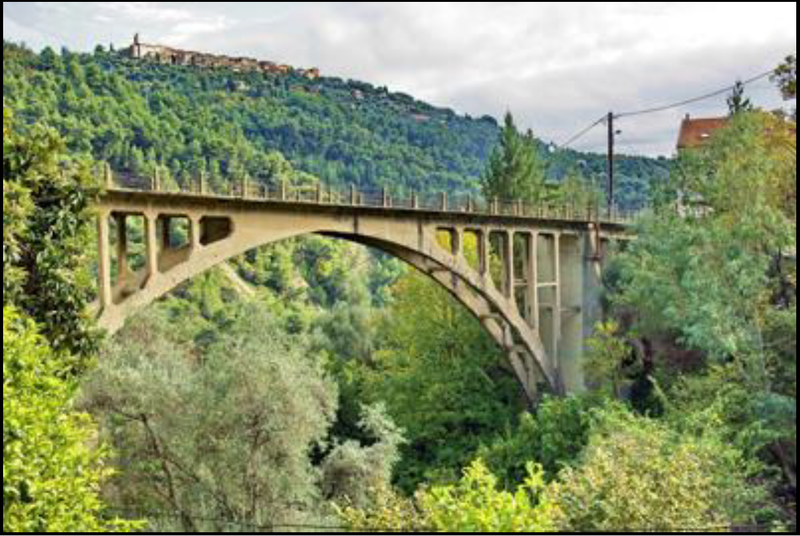 I think that the image below is perhas the best of all the images in this post, it shows the Viaduc du Caramel in the backgroud, the Viaduc du Carei in the foreground and the bridge carrying the D2566 thorugh one of the arches of the Viaduct. 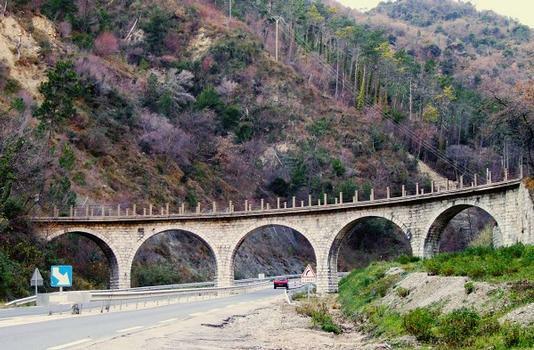 The D2566 used to run through the first arch on the left side of the viaduct on the image below, the new road has significantly reduced the height of what were tall viaduct piers over the valley. 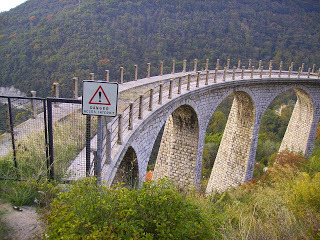 The viaduct is named after the river which flows under it. 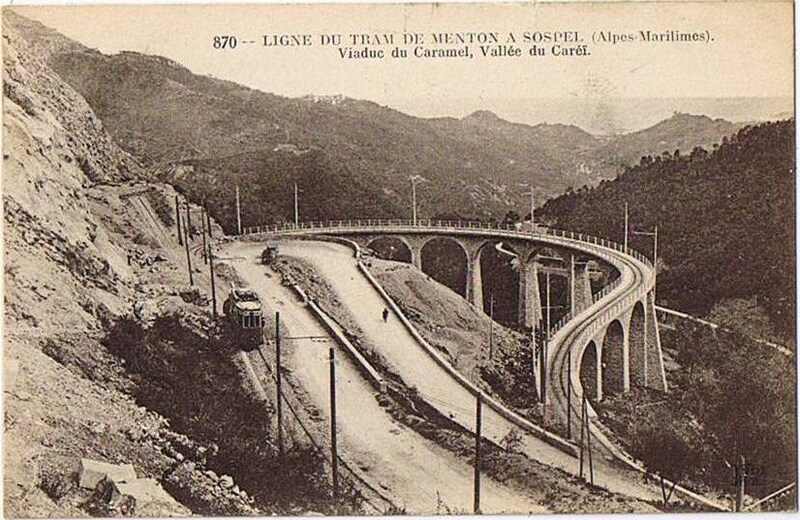 The tramway follows this valley all the way to Menton. 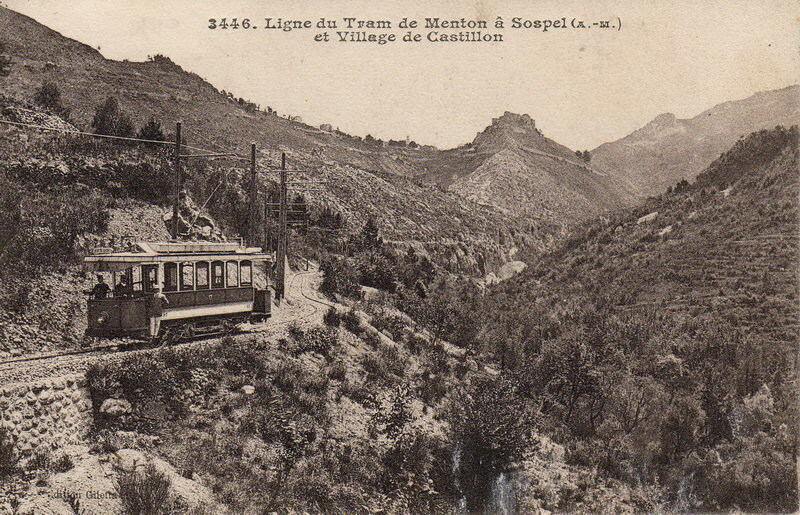 Initially a little distant from the D2566 to the West and at a higher level it rejoined the line of the D2566 for a distance unitl the road dropped steeply away at a hair pin bend and the tramway needed to continue to follow the contours. 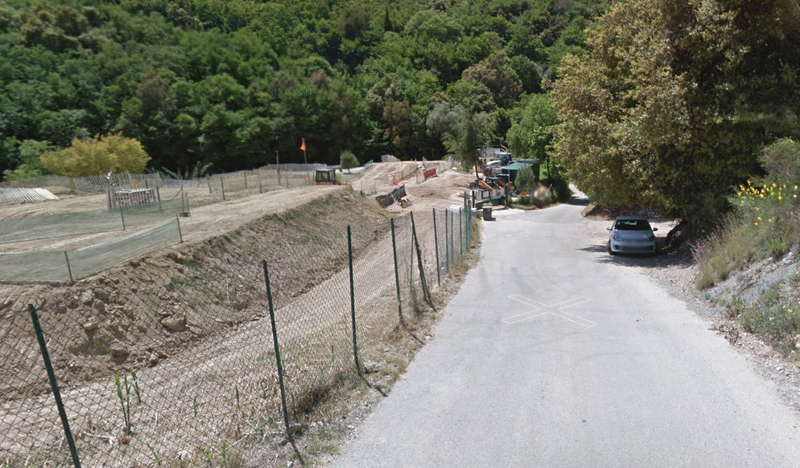 The first image below shows the tramway alongside the road, the next comparative plan view shows the road dropping away and the tramway continuing on the north side of what is now an off-road biking (moto-cross) venue. 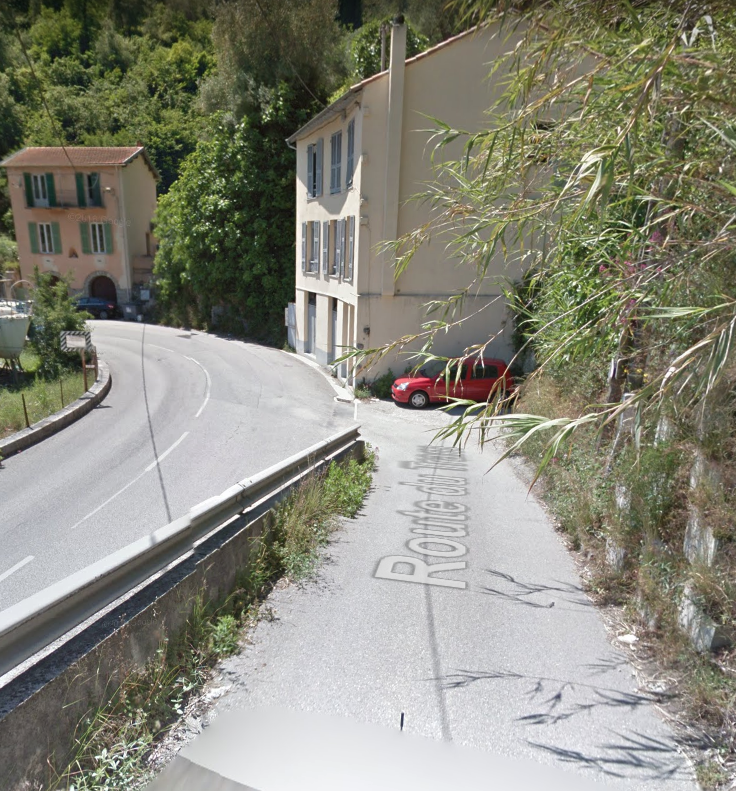 The tramway is marked from this point as the Chemin Ancienne Voie du Tramway on the modern maps. 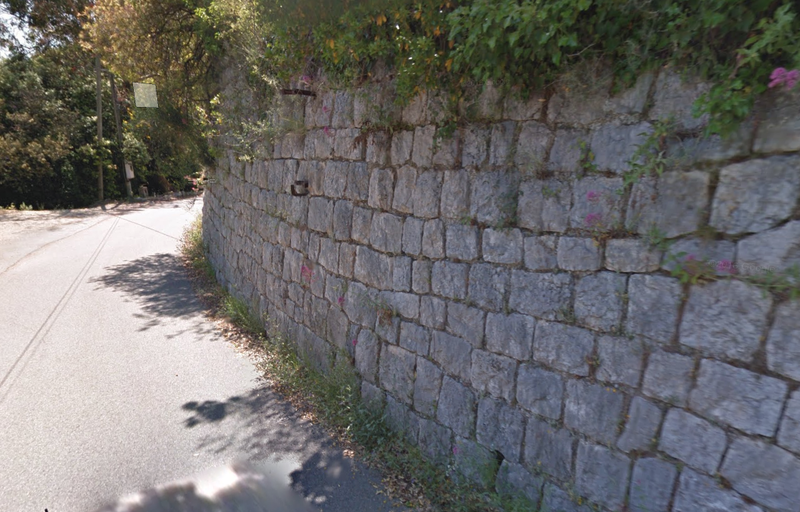 And the formation is tarmacked and we have a record of the rout on google maps and streetview. 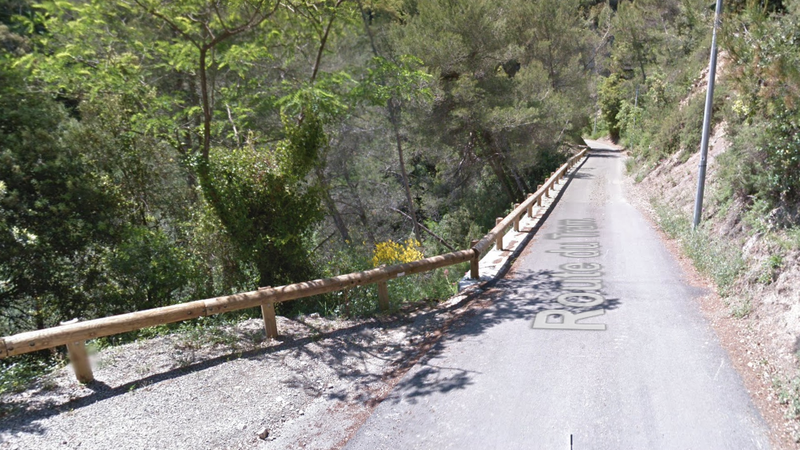 The tramway route seen leaving the road. 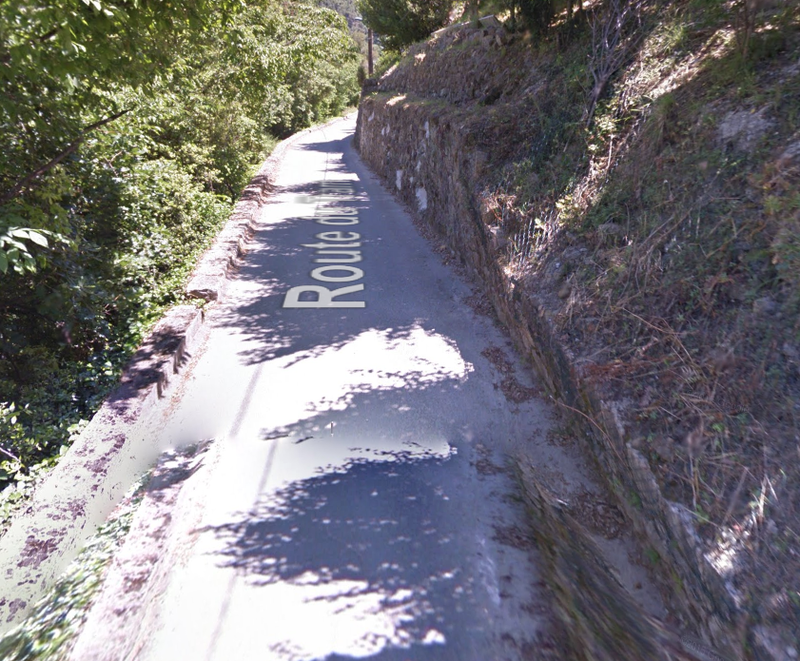 It is the roughly tarmacked route on the left. 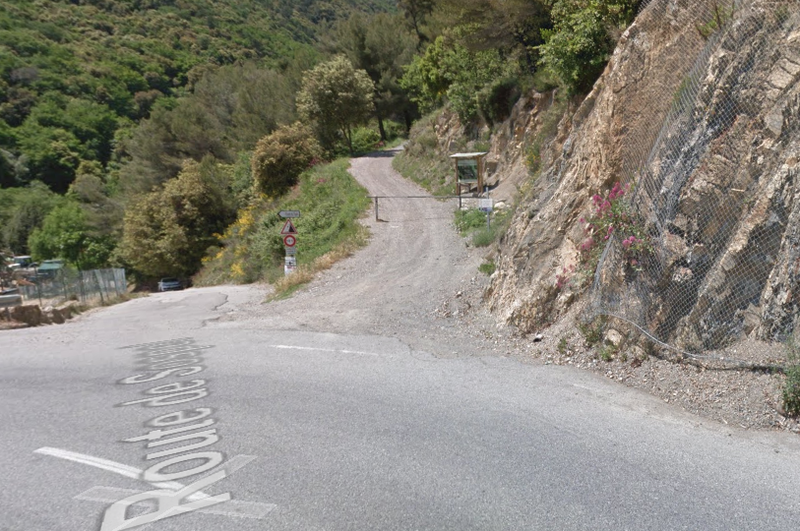 The moto-cross venue is on the left in the second image. 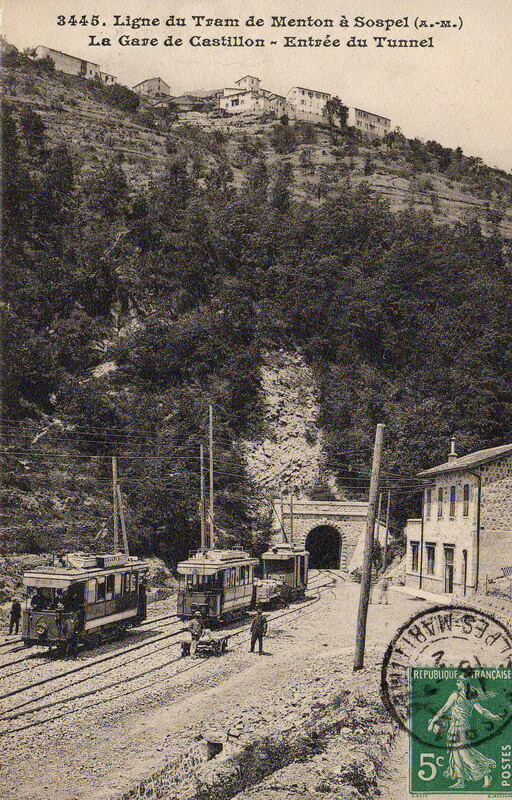 Some substantial structures, particularly retaining walls were needed to create the space for the tramway formation. 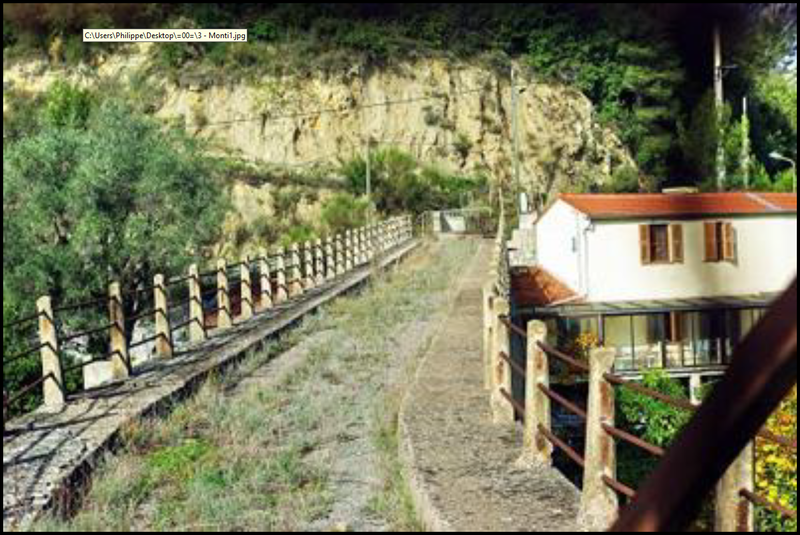 Both above and below the tracks. 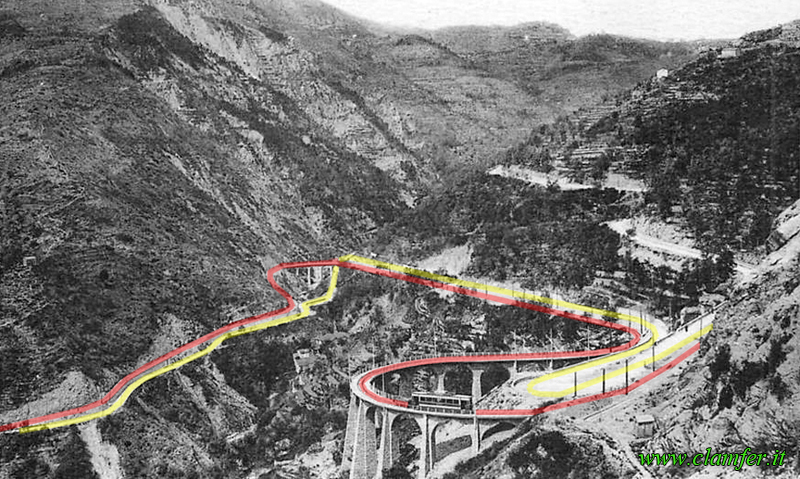 The formation was narrow and at times significantly constrained by the topography of the valley sides. 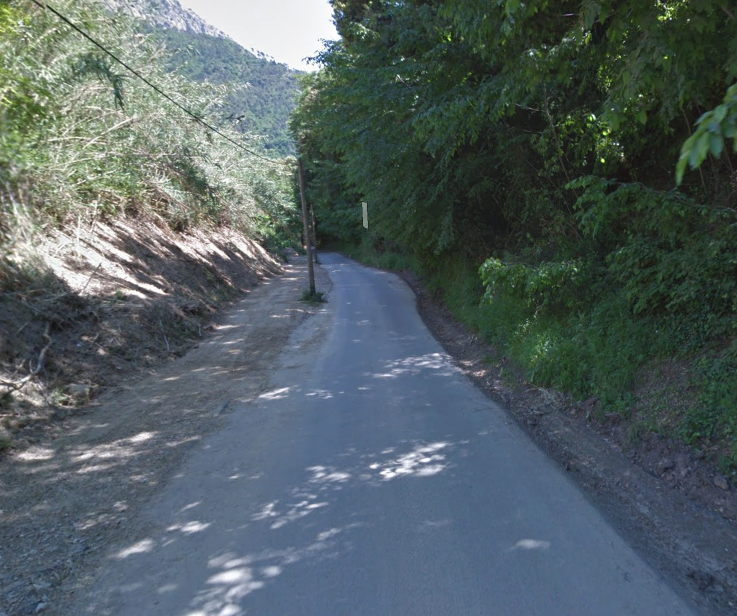 This next image shows the point at which the modern narrow road rejoins the D2566. 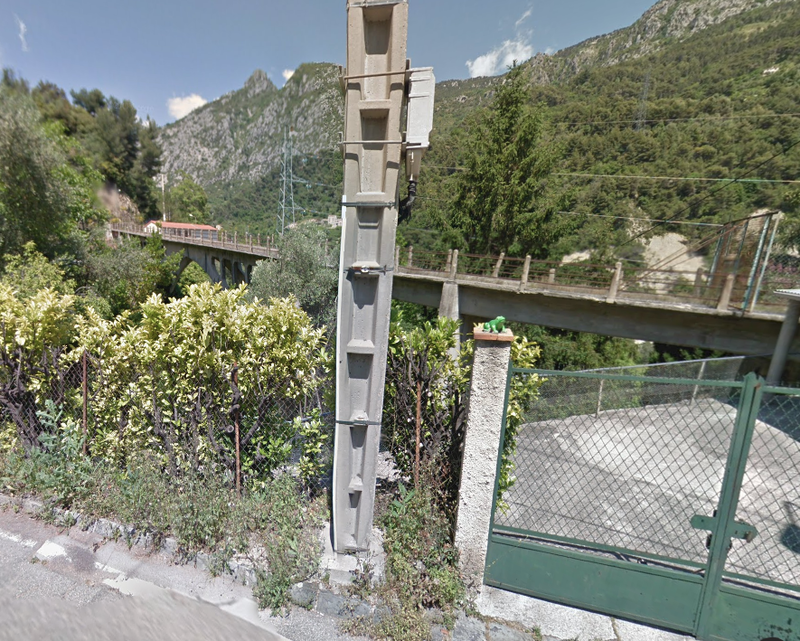 As can be seen on the plan above the tramway rout actually crossed the line of the road. 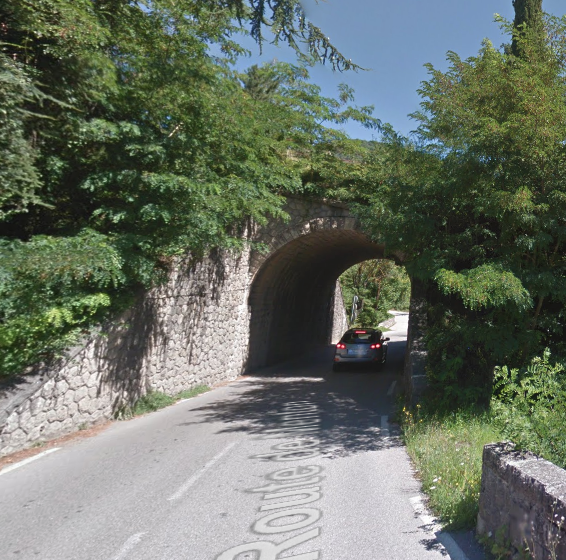 The bridge on which it was carried has now gone. 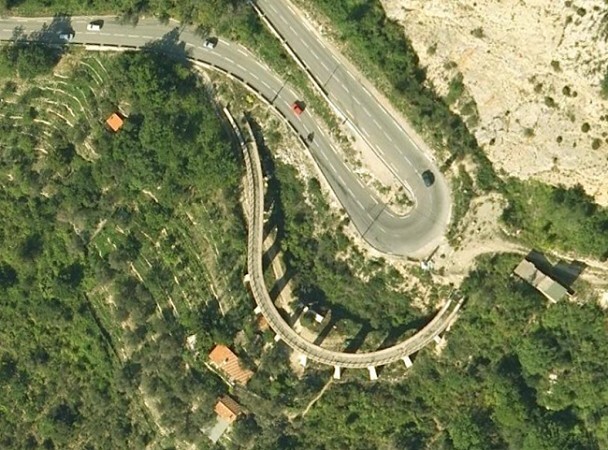 But the route can clearly be picked out on the satellite image below as a viaduct crosses the small valley to the south of the D2566 road. 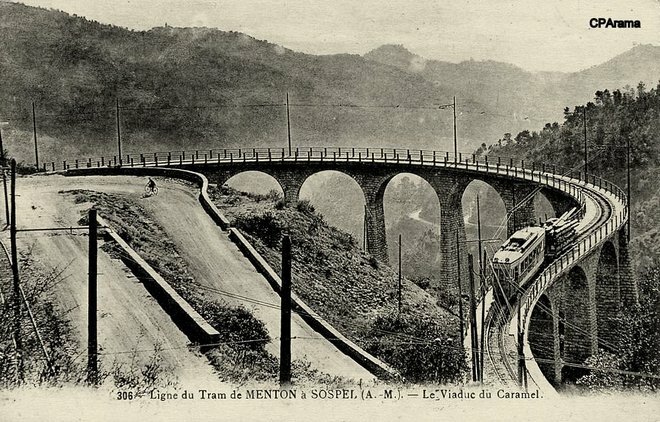 Before we look at old postcards, here are some views of the viaduct at Monti in the 21st Century, the first few are taken from the roads around it. 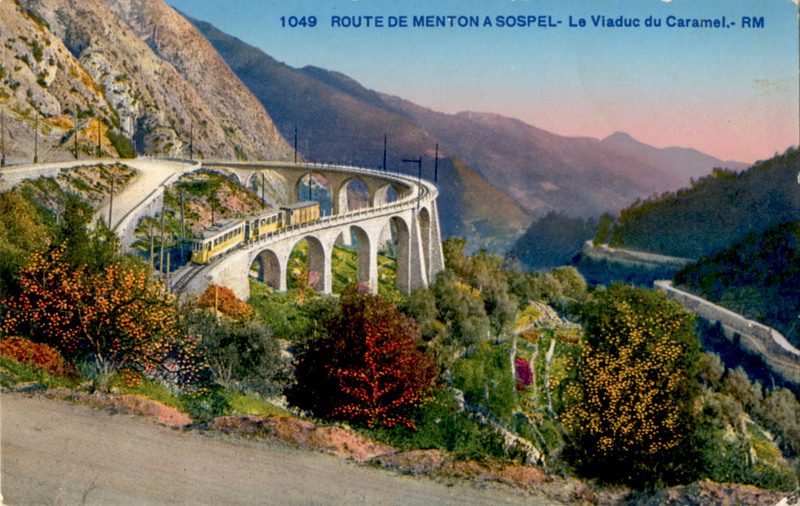 These next images are postcard photographs, first of the viaduct, then of the tramway station at Monti and then of the line south of the village. 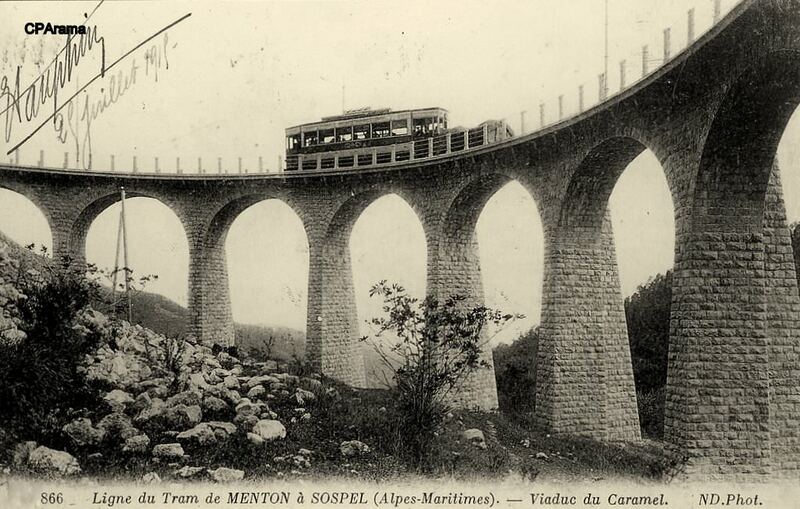 A very serious accident, which cost the lives of two people, occurred on 11th September 1912, about six months after the opening of the Sospel to Menton tramway  . 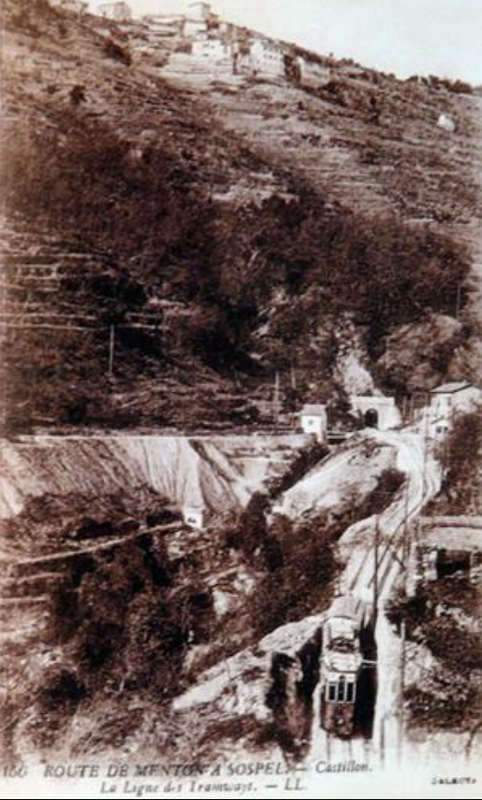 A goods train carrying gravel for the completion of the line left the Caramel Quarry at about 4.00pm with nearly six tons of gravel. 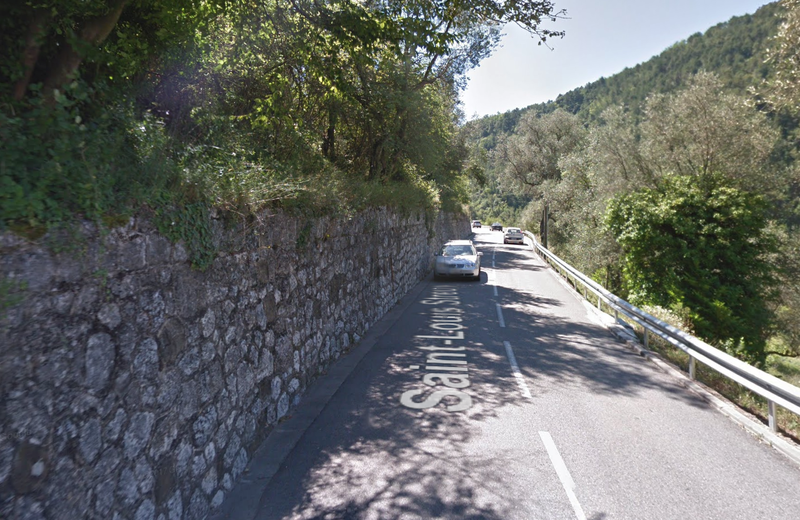 Four people were also due to travel on the train. 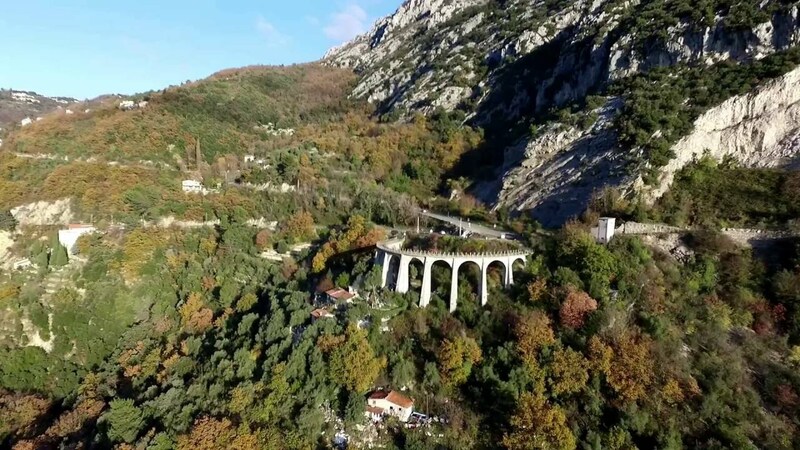 At the last moment, M. Vallaghé, an entrepreneur, and Viale, an employee, decided not to travel on the train as they noticed a rail in bad condition and wanted to wait to warn the next train. This decision saved their lives. 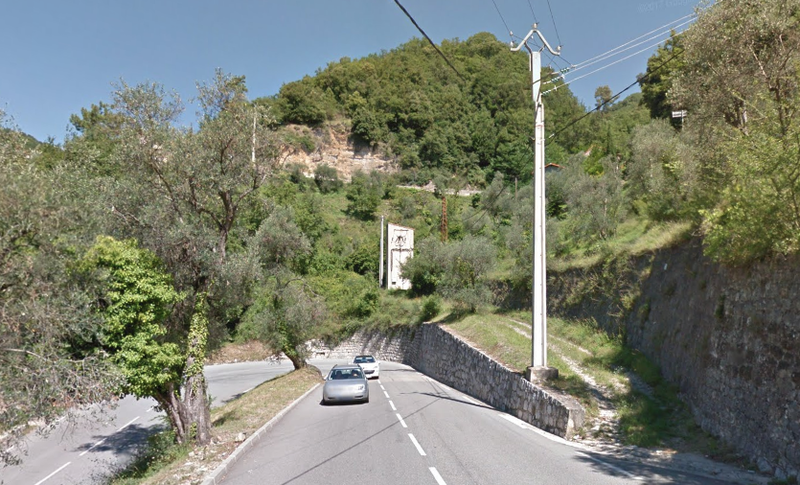 At around 4:30 pm, about two hundred metres before the Monti station, the tram electric catenary boom jumped; the dynamic brake became unusable, the driver tried to use the handbrake, but at the north side of the viaduct of Monti, the pole hooked a rock … The tram became unbalanced and crashed onto its roof some 50 metres below the viaduct, killing both employees. 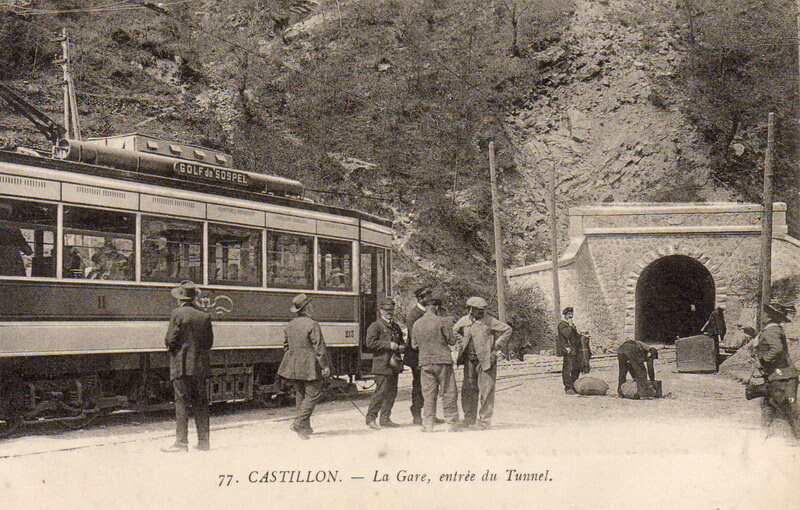 The news spread very quickly and by 7.20pm, the manager of the tramway, the mayors of Castillon, Sospel and Menton, and even the Prefect of the Alpes-Maritimes had arrived at the site. 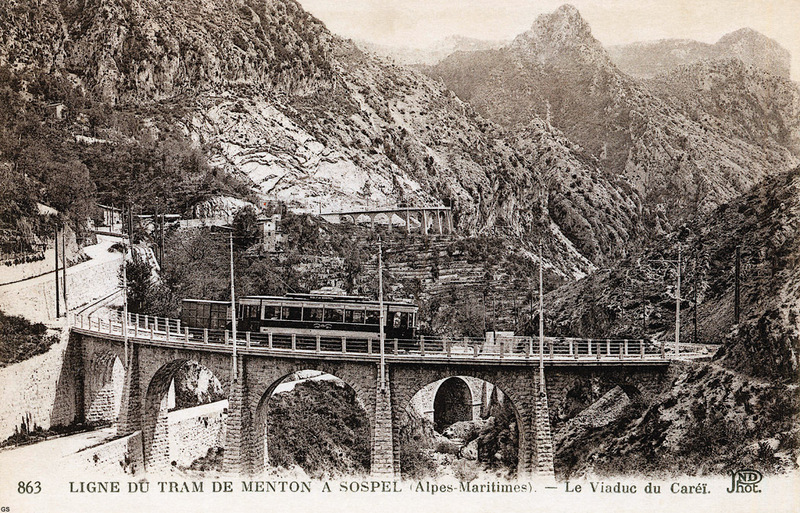 The next day at 4 pm, all traffic on the tramway was halted. 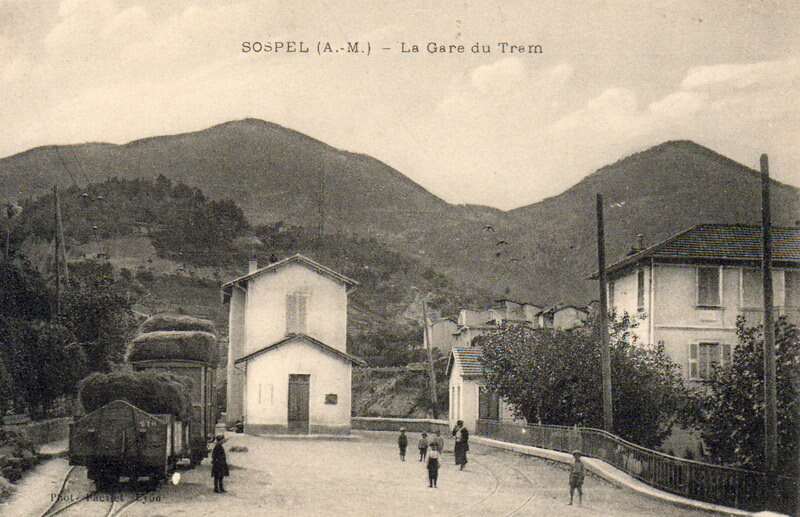 A company tram took the bodies to the Saint-Joseph Church in Carnolès, where the funeral was held, attended by all the network’s workers. 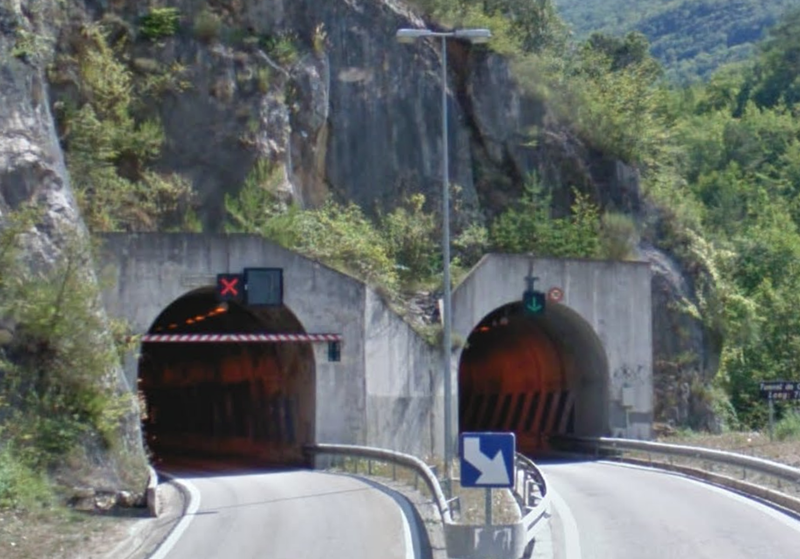 As a result of this accident, various safety measures were implemented, in particular the installation of mandatory stops and safety switches. 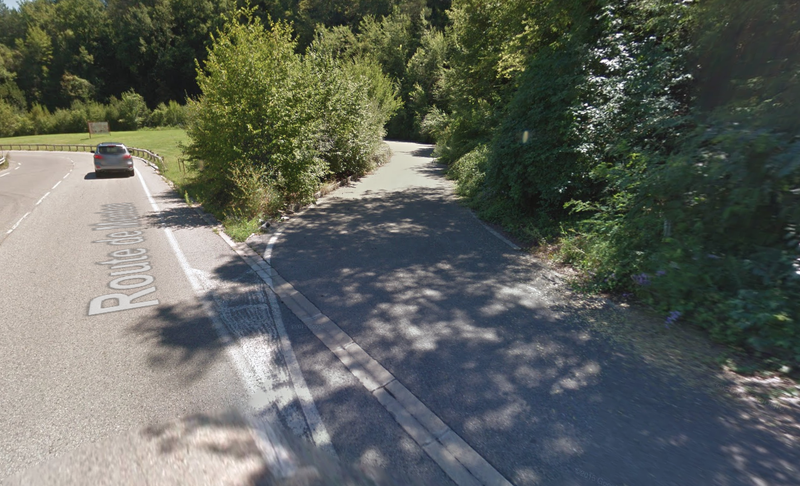 From Monti, the route curves round the edge of the valley gradually dropping through the contours. 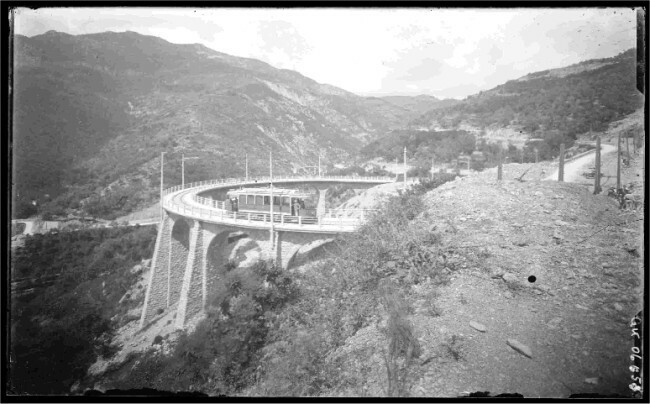 The modern road cuts across one loop of the tramway. 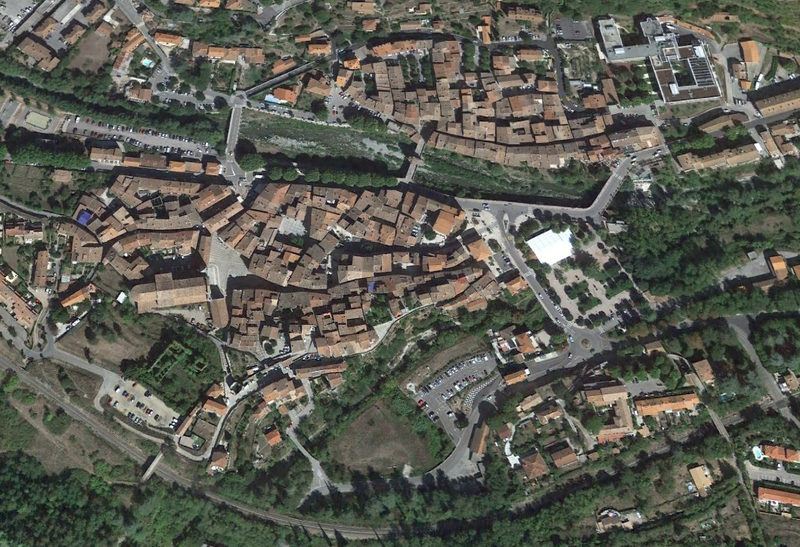 This can be seen by comparing the map and the aerial image immediately above. 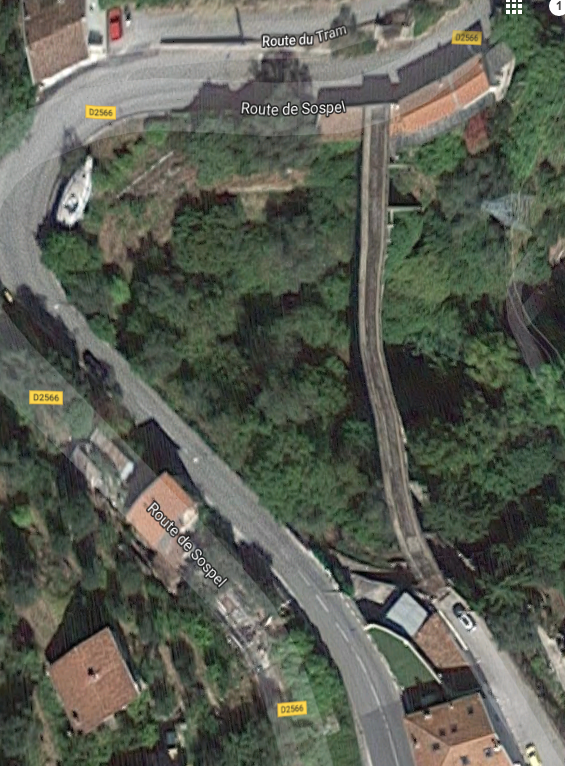 Otherwise the tramway formation follows the D2566 to a point close to the motorway, the D2566 gives way to the off-pink road on the modern map and the tramway follows the Route de Sospel while the old D2566 dropped down into St-Roman (white road). 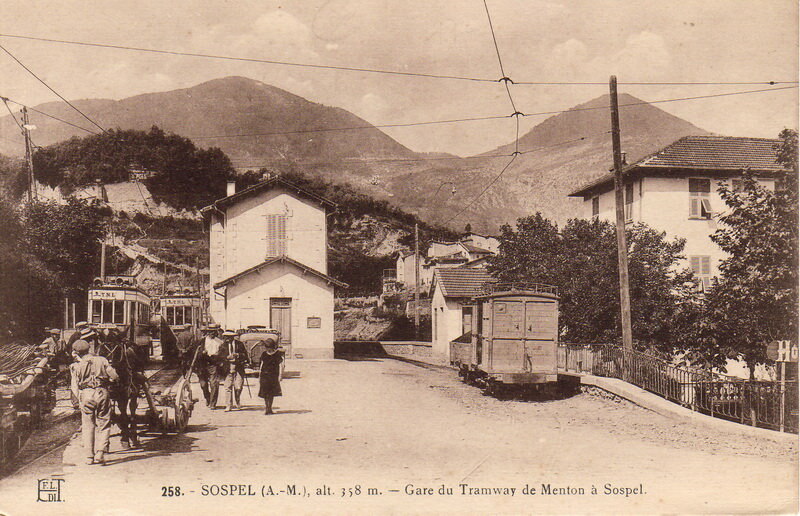 The Route de Sospel at this location overlays the tramway formation and was not present when the tramway was operational in the early 20th Century. 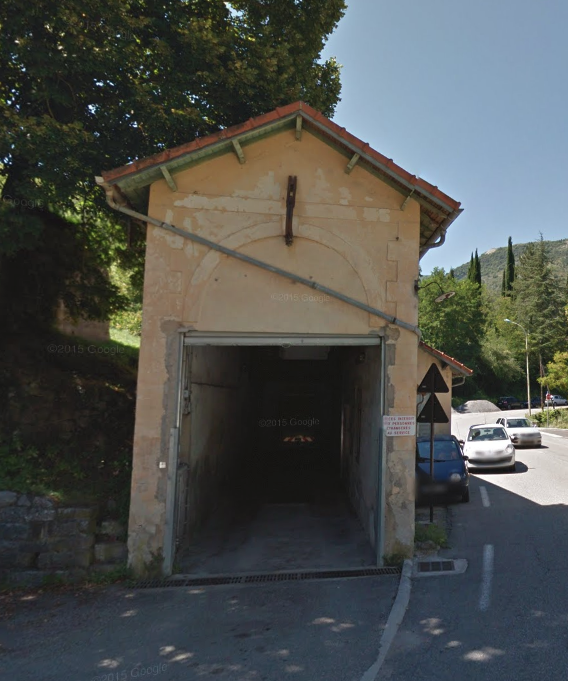 Originally the terminus was back along the valley of the River Carei at a place called “Villa Caserta”, in the valley of the Careï. 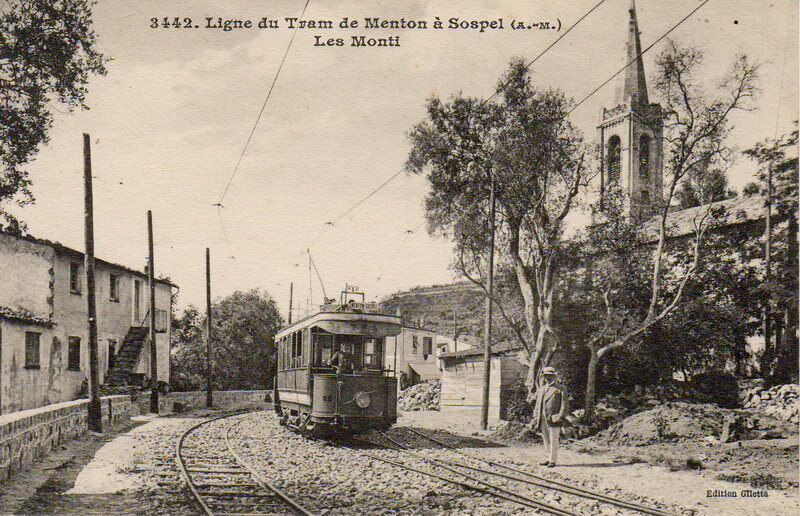 This was the northern limited of the tram network in Menton.
. Wikipedia; Sospel, https://en.wikipedia.org/wiki/Sospel, accessed 23rd February 2018.
. Wikipedia; Sospel Cathedral, https://en.wikipedia.org/wiki/Sospel_Cathedral, accessed 23rd February 2018.
. Inventaire des Tunnels Ferroviaires de France; http://www.tunnels-ferroviaires.org/tu06/06036.1.pdf, accessed 23rd February 2018.
. Heritage Resources of the Alpes-Maritimes; http://www.media-crdp.net/A&C06/bassin-menton-roya/castillon/caramel/caramel_plus.html, accessed 23rd February 2018. 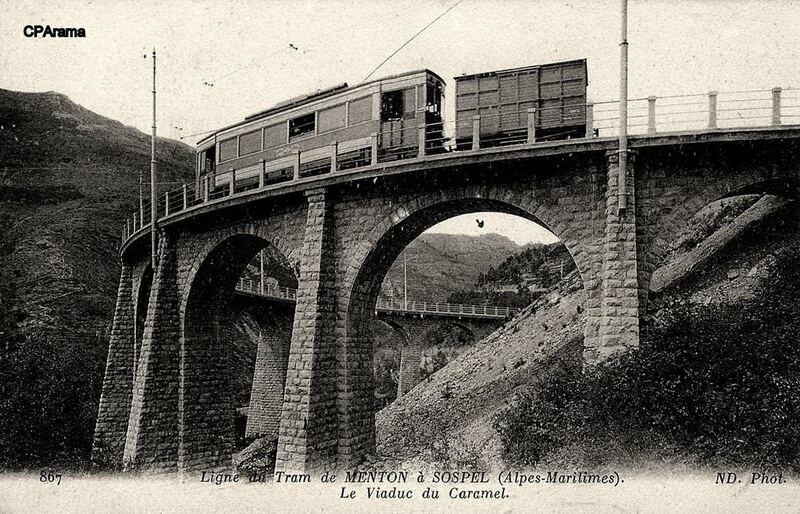 This entry was posted in Railways and Tramways Around Nice, Railways Blog on February 23, 2018 by rogerfarnworth.